The first in a series of Innovation Demo Days will take place in Nairobi, to showcase a selection of exciting innovations from the DEPP Labs programme in Kenya. 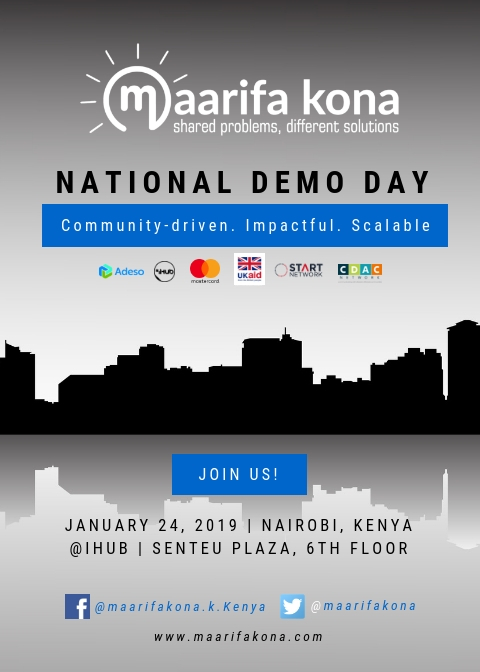 The inaugural Maarifa Kona National Demo Day for Innovators will be held on Thursday 24th January 2019 at iHub, Senteu Plaza, Nairobi. Kenya. The National Demo Day looks to bring together 14 innovators that emerged as finalists from the recently concluded County Demo Days on 6th and 10th December 2018, in Marsabit and Garissa Counties. The finalists will have an opportunity to showcase refined samples/prototypes of products/services that have the potential of solving the identified community problems, toward greater disaster preparedness and resilience to drought. Furthermore, all innovators will be expected to make high-level pitches to the panel of judges and invited guests, detailing unique features of their social innovations, alongside the expected impact and implementation plan. The key outcome of the National Demo Day will be the selection of at least eight innovations that will proceed to the Maarifa Kona Incubation Phase for the next four months. The event is part of the DEPP Innovation Labs programme, which supports local-level innovation to strengthen disaster preparedness. The programme aims to build solutions with communities at risk of crises to reduce the risk they face and to protect lives. The Labs are based in Bangladesh, Jordan, Kenya, Philippines. This event is one in a series of innovation demo day, culminating in the Start Network's Global Innovation Demonstration Day, which will showcase a selection of exciting innovations from across the DEPP Labs in London on the 1st of May 2019. For more information or to register your attendance for the Nairobi event, please contact Eric Mogoi on enyangesi@adesoafrica.org or Nicholas Njoroge on nnjoroge@adesoafrica.org. Read more about DEPP Innovation Labs.